What better way to start than with a few of my favourite places to eat good food and drink good beer, in my adopted home town of Leeds (lived here for over 6 years now). First up is The Stew & Oyster (aka "Calls Landing"). Located just off Call Lane, this recently extended bar is a fantastic place for, well, Stew and Oysters. But there's also an extremely well stocked beer fridge including the likes of Brooklyn Lager, Duvel and Liefmans; as well as some well chosen keg beer offerings and 3 regularly changing cask beer hand pulls. A choice of 3-4 stews are usually available. All are tasty, hearty, and satisfying, with an impressively multi-national range of flavours on offer. Past favourites of mine include Italian tomato and meatball, butternut squash and pumpkin, and possibly best of all, chorizo sausage and butterbean. Theakstons is the house ale, and guest ales are generally from larger breweries such as Adnams and Greene King, but occasionally some lesser known breweries will also get a look in. If I had one gripe it would be that the ale is sometimes served a touch too cold, but it's a personal thing and others may find it just right. All in all it's a relaxed bar that serves simple, cheap, tasty food and a selection of good beers. 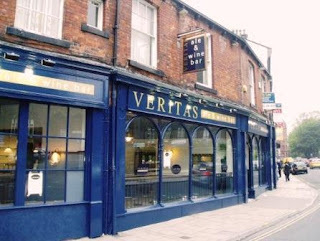 Next up is a fairly new bar, but one that is fast becoming a favourite of mine - Veritas Ale & Wine Bar, on Great George St.
Veritas has a very similar interior style to its sister bar Arcadia in Headingley, but utilises the extra space to great effect with a large curving deli counter serving local cheeses, meats and nibbles as well as an impressive and regularly changing menu of lunch and evening meals. The steak and Ale 'Pie of the day' and the roasted belly pork with cider apple gravy being two highlights that come to mind. With 8 real ales on offer and some well thought out beers on tap (including my girlfriends favourite Fruli), plus an extensive bottled beer menu, this is a beer lovers dream. The ever changing guest ales mean there's always something new on when you visit - For example I’ve had Brewdog IPA (old recipe 6% cask version), Elland 1872 Porter, Black Tom Mild, and Black Sheep Riggwelter to name but a few, and they’ve always been in excellent condition. Plus the chalkboard lists the guest beers' price, style and strength, making a decision much easier. The Veritas bottled beer menu is also a very nice touch. A huge number of different beers from around the world feature, and are grouped into various categories with short well written explanations of the flavour, strength and style of each. Plus they’re one of the few bars in Leeds (Arcadia being the only other to my knowledge) that stock the outstanding Brooklyn Dark Chocolate Stout, and have a collection of the more unusual Belgian beers such as Kwak and Floris at very reasonable prices. 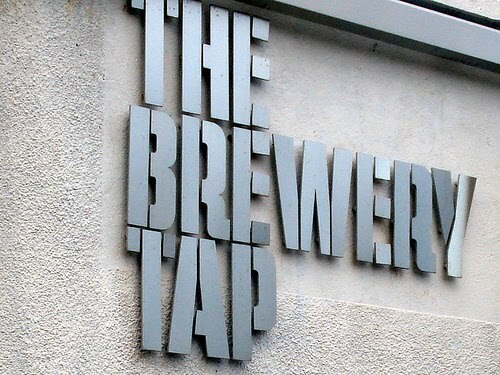 My third pick is The Brewery Tap on New Station Street, near, you guessed it, Leeds Train Station. It's one of a few Leeds Brewery pubs in and around the city centre; notably The Midnight Bell (very good food but a little expensive, more of a gastropub type place), and PIN (unusual little bar on the trendy Dock street, but is a bit too 'cocktail bar' for my liking). The Brewery Tap however, strikes a nice balance. There are generally all three of Leeds Brewery's regular beers (Pale, Best and Midnight Bell) plus one seasonal special and a few guest ales on offer. They even have their own lager called Leodis (the Old English name for Leeds) that's brewed on site, as well as the likes of Sierra Nevada and Leffe on tap, and an excellent wine menu - essentially it's one of those places that has something for everyone. The food doesn't let the side down either, the menu is best described as 'pub grub' done properly, with everything made from scratch on site and executed with skill and care. Whether it's a homemade burger with fresh tomato salsa and hand cut chips, 'Leeds Best' battered fish and chips with minted pea puree, or a simple Steak and 'Midnight Bell' pie, you can be sure you'll get a tasty meal. The Adelphi on the corner of Dock Street and Hunslet Road is a fantastic pub with a number of small rooms all served by one main large bar, it looks pretty traditional from the outside but it is actually modern and quirky on the inside, with interesting, tasty food and drinks to match the shabby chic decor. Anthony's on Bore Lane is as close as Leeds has got to a Michelin starred restaurant and fully deserves the praise it recieves. As well as mind-blowingly good food they are one of a thankfully growing number of high end restaurants in the UK to appreciate the necessity for a well chosen beer list, as well as a wine list the size of a phone book. The Cross Keys on Water Lane is just down the road from the aforementioned Midnight Bell and its only downfalls are very similar. A little bit too 'gastropub' in terms of prices and a little bit of a walk from the City Centre. That said, the food is fantastic, with an impressive menu including lots of seasonal and local produce as well as some excellent ale and beer on the bar. It's owned by the same people who run North Bar, which if you've been, is enough in itself to bolster it's beery credentials. I fully agree with you about the vibe of Pin - but Rich of Them Apples fame swears by thier Burger. One to check out if Rich rec's them! I do like the food at The Adelphi. He's definately right about the PIN burger, because it's pretty much exactly the same as The Brewery Tap, and that one is awesome! Don't get my wrong, I do like PIN. It's a nice little bar and it is worth a visit, I just think it's got a bit of an identity crisis. Particularly on weekends when the Cocktail Crowd descends! Yes, PIN needs a bit of a rethink, drinks-wise. 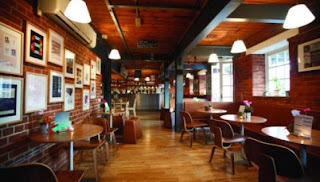 It usually has only Leeds' core range and no guests, which is unusual for a pub owned by a microbrewery. The range in the fridges seems to be skewed to the beers you'd find in a Tapas bar. In fact last time I was in they said they didn't do cocktails any more either. However the food is good and can be decent value when there's a midweek offer on. They actually used to do some great, and relatively cheap, beer based coktails as well. There was one with some apple and pear based spirits shaken with ice then topped up with Leeds Pale that was very nice. But then they just stopped? The food is good like you say, very similar to The Midnight Bell, which for me wins because of location and the beer selection. With a little bit of thought I think PIN could find it's niche though.